is a rail shooter light gun game. Players use a light gun (or mouse, in the PC version) to aim and shoot at approaching enemies. The characters' pistols use magazines for rounds, and are required to reload once each magazine is empty. To reload the magazine, players aim somewhere outside of the play screen and squeeze the trigger. A set of torches next to the clip of each player represents remaining health. Anytime a player is attacked or shoots a civilian, one of their torches is removed, signifying damage. A player is considered "dead" when all of his or her torches are lost. A player may then continue by inserting more credits (if playing on an arcade machine) and pressing the "continue" or "start" button. There are First-aid packs available throughout the stages that will restore one torch, or unit of health. These are found either in the possession of civilians that the player has rescued or inside breakable objects located i n the background of the gameplay. Similarly, there are also special items located in breakable objects that will grant a bonus to the score of whoever shoots it. This game was one of the first to implement the "branching path" game mechanic. Throughout the course of the game, players are given numerous situations in which their actions will have an effect on the direction of gameplay. For instance, in the beginning of the game, a male civilian is about to be thrown off the bridge to his death. If players shoot the zombie and save the civilian, they will enter the house directly through the front door. However, if the civilian dies, players are redirected to an underground route through the sewers. There are other critical points in which the players' actions decide where they go. This branching path system was also implemented in subsequent installments to the series. On December 18, 1998, AMS agents Thomas Rogan and "G" are sent on an assignment to investigate a panicked phone call from Rogan's girlfriend Sophie Richards and a series of disappearances at the Curien Mansion, home laboratory of Dr. Curien, an acclaimed biochemist and geneticist. Dr. Curien was obsessed with discovering the very nature of life and death, backed by the DBR Corporation and its scientists. The nature of the experiments, however, drove Dr. Curien insane, resulting in him releasing his experimental subjects onto the unsuspecting world. Amidst the chaos wrought by Curien, Rogan and "G" face many formidable foes, including The Chariot (Type 27), a plated undead warrior who mortally wounds Sophie (whether she survives the wound or not depends on player performance upon beating the game), The Hangedman (Type 41), a gargoyle-like creature which sees to it that she cannot escape the mansion grounds, as well as The Hermit (Type 6803), a mutant spider crab guarding the passageway leading to Curien's restricted research area. Upon confronting Curien, the AMS agents are treated to his greatest masterpiece, The Magician (Type 0), a humanoid creature with mastery over fire. Ironically, after he releases the creature from its incubation chamber, Dr. Curien is killed by his creation; "The Magician" seemed to have reached a state of sentience in which he feels an inferior being such as a human has no place in giving him instructions. To prevent the Magician from escaping the mansion and destroying the world, Rogan and "G" killed it before any harm could be done. was a first-person shooter developed by Rebellion Software and published by Atari for the Atari Jaguar in 1994. Based on the Alien vs. Predator franchise, the game allowed the player to choose one of three characters: the Alien, the Predator, or Colonial Marine Pvt. Lance Lewis. The game's engine is much like Wolfenstein 3D: a flat plane, no stairs or open elevators, two-dimensional sprites, and all walls turn at 90 degrees (but sometimes with transparency). Each character was well balanced and provided a different gameplay style (the levels were the same, but the strategies different). Playing as the Marine, you had computer terminals to learn the ill fates of the other marines (similar to the PDAs in System Shock). Many fans consider this to be one of the best games for the Jaguar. 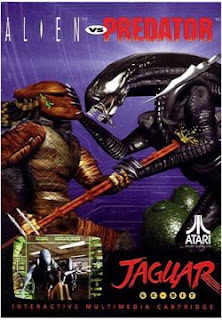 Alien vs Predator for the Jaguar console is a precursor to the popular PC game series released in 1999, which used 3D polygon graphics. Some still prefer the Jaguar version, as the sprites could more closely duplicate cinema qu ality than primitive 3D polygons. 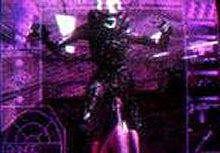 The Alien's objective was to rescue the Alien Queen, who was being held captive on the Predator's spaceship on Sublevel 1. The Alien always starts the game from Sublevel 5. Since the survival of the Alien hive was more important than an individual Alien and also because the Alien could not use medkits as the Predator and Space Marine could, it had to depend on cocooning Space Marines in order to extend the gameplay. You could have up to three cocoons. If an Alien died with surviving cocoons, the last cocooned Space Marine would turn into an Alien. If an Alien died with no cocoons in existence, the game ended. Since the Alien could not use the elevators, it had to use the airducts to advance from Sublevel to Sublevel. Once the Alien Queen is freed, the game ends. The Alien scenario is generally considered to be the easiest of the scenarios, since the character is faster than the Predators and Marines and does not fight the facehuggers or the Alien Queen. The Alien may als o roam the air ducts free of other enemies, especially helpful while allowing cocoons to mature. It is the shortest mode, fundamentally a point A to point B challenge. The Alien scenario is the only scenario which the player can have extra lives. The Predator's objective was to get to the Alien's ship and kill the Alien Queen in order to claim her skull. The Predator always started the game from Sublevel 1. The Predator could not use the airducts, instead using the elevators to advance from Sublevel to Sublevel. The Predator could also pick up medkits and keep them in reserve until needing to use them by pressing a special button. The Predator also operated under an 'honour system' whereby it lost points for killing an Alien or Space Marine whilst cloaked but gained points for uncloaked kills. The weapons available to the Predator were dictated in part by their honour points - as such too many dishonourable killings could result in losing or failing to acquire weapons. is a media franchise consisting of a survival horror video games series, comic books, novelizations, three Hollywood motion pictures, and a variety of collectibles, including action figures, game guides and publications. Developed by Capcom and created by Shinji Mikami, the game series has been heavily influenced by George A. Romero's Dead movies, as well as the Alone in the Dark series of PC games.The games have sold over 30 million copies as of February 2006. As of 2007, there are six games in the main series (excluding remakes), with seventh and eighth installments currently under production. known as Project Zero in Europe and Zero in Japan by Tecmo, is a survival horror series, so far consisting of three games. The first and second games in the series were released for the PlayStation 2 and Xbox. The third game is currently only available for the PlayStation 2. The series deals with exorcism, dark Shinto rituals, and above all, ghosts. Created by Tecmo, Fatal Frame is one of the most well received survival horror games to date, largely due to the atmospheric music, dark and claustrophobic environments, emphasis on aesthetics and art design and the variety of spirits encountered during the course of the game. The main object of the game is to solve a mystery which is linked to old Japanese superstitions. The player's main enemies are ghosts; a few are friendly, but most are not. The only form of defense is a camera obscura, which allows the player to exorcise ghosts by taking a picture of them and thus, sealing their spirit in the film. Throughout the series, references are made to Kunihiko Asou, a fictitious Japanese "Occultist" that lived during the late nineteenth century. Using western technology, he developed inventions that would allow him and others to make contact with spirits in the "other world." His inventions include the camera obscura, the primary weapon used to defend against ghosts throughout the series, the spirit stone radio, introduced in Fatal Frame II as a means to listen to the thoughts and memories of spirits that had been stored in special crystals, and a projector capable of displaying ghostly images captured on film that motion picture cameras could not see. According to Fatal Frame III, Asou's various inventions were eventually scattered about Japan and are now heavily sought after by collectors. The camera obscura used by Miku in the first game had once belonged to her mother, and Mio finds a different camera obscura while exploring the lost village. It is likely that the broken camera obscura Rei finds (which was sent to her fiancé by Mio's uncle Kei) is the same camera that Mio used in the second game. is a survival horror video game franchise developed and published by Konami. As of 2007, most installments have been created by Team Silent with the exception of two upcoming titles, Silent Hill: 0rigins, which is being developed by Climax Studios, and Silent Hill V being developed by The Collective from Foundation 9 Entertainment. There are currently five Silent Hill games available with three under production (although one title, Silent Hill: Play Novel, was released exclusively in Japan), all of which were released to strong sales and critical acclaim. The success of the series has generated several comic books, one movie adaptation (with a second release under development), and novelizations. The gameplay includes frequent horror elements, action, various puzzles, detailed and disturbing environments, chilling background music provided by composer Akira Yamaoka, and a complex storyline revealed through numerous cinematic cut scenes and in-game documents and notes. Each game unfolds like a movie with several possible endings; the player's choices during the game determine which ending is shown. is one of the longest running series of anime featuring giant robots or mecha, created by Sunrise. Gundam is the collective term for the Universal Century (UC) series like Mobile Suit Gundam and series in alternative timelines, such as Gundam Wing, Gundam X or Gundam SEED. The name "Gundam" itself stems from a variety of theoretical sources, most commonly attributed to a need to conform with common giant robot naming conventions during the 1970s. is an American animated series which debuted on October 31, 1992 on the Fox Network as part of its Fox Kids Saturday morning lineup. X-Men is Marvel Comics' second attempt at an animated X-Men program, after the ill-received half-hour pilot "Pryde of the X-Men" was broadcast multiple times between 1989 and 1992. It is widely considered, along with Batman: The Animated Series, to be the most faithful animated series based on a comic book. The popularity and success of X-Men (along with Batman, which also debuted in the Fox Kids 1992–93 season) helped launch a number of comic-based animated series in the 90s. It was created in Japan, as Pocket Monsters and was then adapted for the North American television market. In the United States, Pokémon is the fifth longest running animated TV show time wise, only beaten by The Simpsons, King of the Hill, Arthur, and South Park. Pokémon, however, has more episodes than any of these shows and is the longest running and most successful television show based on a video game series. The metaseries appeared outside Japan before the video games did, and has since spawned several movies. It is aimed at younger viewers but many other devoted fans of all ages enjoy the anime as well. With 200 episodes airing from March 7, 1992 to February 8, 1997 on Japan's TV Asahi, Sailor Moon is one of the longest magical girl anime series. The anime sparked a highly successful merchandising campaign, which contributed to demand all over the world and translation into numerous languages. Sailor Moon has since become one of the most famous anime properties in the world. The anime is performed by Isono family, and it is based on the comic strip "Sazae-san" drawn by Haegawa Machiko. The comic strip has been in Asahi Shinbun from 1949 to 1974. This is the longest anime series running in Japan; started in 1969 up to 2004 One program consists of totally more than 5500 episodes broadcasted. Also, the anime is one of the most popular anime in Japan; the audience rating recorded 39.4% in 1979, and it is still around 25% now.